“Content creation” seems to be one of the most buzz-worthy phrases these days. With the proliferation of social media posts, YouTube videos, blogs, etc., there’s seemingly never an end to the advice on how/when/where/why to create content. For the sake of this post, we’re going to focus on our written website content. Don’t you worry, we’re talking about video content tomorrow. And if you missed it, we talked about our (intentional) social media content strategy yesterday. Be sure to scroll to the bottom of this post to watch our unedited meeting all about content where we chat articles, videos, podcasting and social media! We’ve never focused purely on quantity of output. While we definitely believe in the value of consistency, we've always maintained an intentional schedule to our content that we knew we could keep (and that allowed us to focus on creating our best work while enjoying our lives). Caroline and I have used a weekly publishing schedule that we’ve stuck to for 3+ years. Going forward, we're going to lean into this approach even more. Our belief is that if you create REALLY high-quality content that readers go back to again and again, you're giving yourself the ability to stand out in the sea of lack-luster content. These days, with big media sites publishing dozens of articles a day and even indie creators trying to publish daily, our strategy is to provide a respite from that clutter for readers who want to go deep on one subject and stay awhile. One important thing to keep in mind though, we didn't start with SEO. The “O” in SEO is Optimization (duhhh). It’s impossible to optimize something that has just come into existence. For my content specifically, I’ll write a post about something and then keep an eye on it. If it starts to gain some organic search traffic (say in, 6-9 months) I’ll go in and optimize the post based on what it’s ranking for. If you want, you can read all about my approach to SEO here. #1: In-depth guides - We’ve both written a handful of in-depth guides (like the SEO article I mentioned a moment ago) on our individual sites (MadeVibrant.com and JasonDoesStuff.com). These posts go into heavy detail breaking a large topic down into bite-size actionable chunks. Our guides are typically what end up ranking on the first page of Google and bring in sizable traffic to our blogs. These guides typically take anywhere from 20-100 hours to write (yes, up to 100 hours spent on one article!) but they pay dividends for years to come. Going forward on Wandering Aimfully, we'll not only combine many of our previous articles into these longer form comprehensive guides, but we'll also intentionally publish them going forward. For example, every post within this "under construction" build phase of Wandering Aimfully will likely get edited and combined to create the ultimate How To Start An Online Membership Business From Start to Finish guide. #2: Individual articles/blog posts - Now, we also want to leave room for us to continue publishing some of the one-off topics we want to write about. Things like the “18not180” Approach or I Want Enough. These are more "thought nugget" posts and it’s not likely that these will ever hit the first page of Google (which is okay, because the bulk of the writing we do isn’t written for that purpose). Our one-off topics are ideas or mindset shifts we want to share with our audience. These articles can take anywhere from 4-10 hours to write. This is the type of writing I’ve focused on since 2014. I’d say How-To content makes up about 75% of the things I’ve written and shared these past few years. These are posts that teach you the process of doing something and are usually more tactical. There was absolutely no strategy with my initial How-To posts. I didn’t focus on trying to rank for any keywords (hello, SEO!). I wasn’t trying to become known for any specific task/tactic/subject. I simply wanted to share my experiences and stories with other people, hoping they could skip some of the mistakes, failures, and in-depth learning I had to go through. My non-strategy of writing How To posts took my blog (JasonDoesStuff) from 0 visitors in 2014 to over 500,000 in 2017. I’m not a math-magician, but that’s a pretty awesome traffic increase! Wandering Aimfully guides will be the go-to source for start-to-finish comprehensive information on a single topic. These guides won’t be a walk in the park to create. They’ll take a ton of time, loads of creative energy, and will have to be tweaked going forward. But we’re willing to invest the time and energy because as the Internet has gotten more saturated with content, in-depth valuable content gets rewarded (by Google and with word-of-mouth sharing). While How-To stuff is great, we don’t just want to become a process blog. We know it’s equally important to discuss not just tactics or processes, but also the mindset behind WHY we do things the way we do things and the bigger discussions around intention and values. As Caroline and I talked about how to balance these two approaches in our content, we realized this was well suited to our individual writing styles. I have a tendency to focus more naturally on How-To content and Caroline gravitates toward the more emotional and personal values-driven aspects (the Why-To). Of course there’s overlap, but we like that our content reflects the balance of strengths and perspectives that each of us brings to our partnership. These Why-To articles will probably never get a ton of organic traffic. Some content creators would think this is a waste of time. We know that not every piece of content we create has to have a long-tail measurable reward. And actually, we’d argue that building trust with our audience and providing helpful Why-To content can be as rewarding as having a search result on the first page of Google. Trust is nearly impossible to quantify, but it can be just as hard and elusive to chase as ranking for a certain keyword or phrase is. We believe one of our strongest selling points with the content we create is transparency. We’re not afraid to show every aspect of something, especially if that involves tough lessons we’ve learned by doing things the wrong way (dear pride, it’s time for you to be swallowed). Some folks are afraid of giving away trade secrets. If they figure out a process or strategy, they want to keep it all to themselves (and then most often try to monetize it). We want to focus on giving away 95% of our ideas, processes, strategies, and share content that’s so helpful that people want to buy our Wandering Aimfully monthly membership because they know the paid stuff will be as good or better than the free stuff they’ve consumed. How are we migrating over our existing 400+ articles? First, if it’s not obvious, we should probably mention that we aren’t leaving our previous content in the dust. In fact, quite the contrary. Even though JasonDoesStuff.com and MadeVibrant.com will be going away, all of the blog content that lived on our sites will be moving over to Wandering Aimfully. We had a spreadsheet put together that listed out every article we’ve written for JasonDoesStuff and MadeVibrant. In that spreadsheet, we’ve also tried to identify the main topic for each article. A large task on our to-do list before launching Wandering Aimfully is to sit down and see which of our articles can be combined together. We’ve both written about a topic and then a year later had updated thoughts on that topic (probably forgetting that we wrote the original article). As an example: I know for a fact we’ve both written articles on Audience Building. 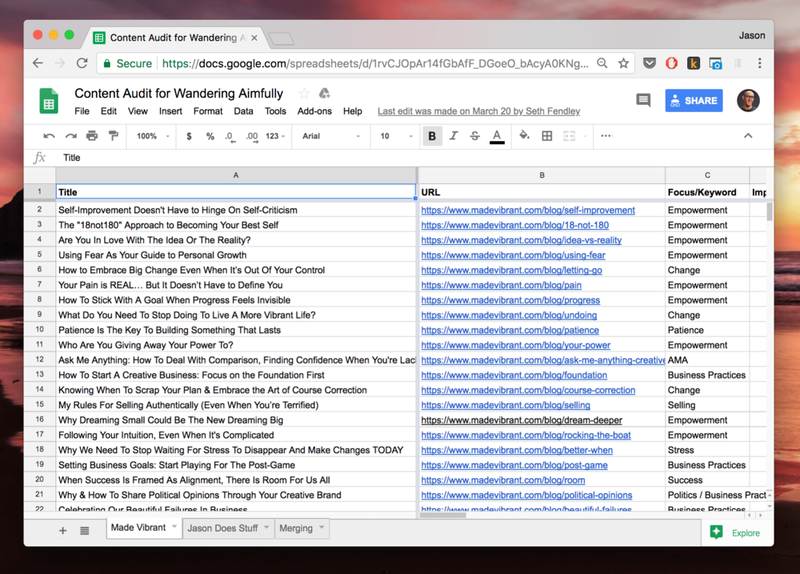 Instead of migrating each individual article over, we’ll combine all related audience building articles into one guide! Heyo! During the process of combining these articles we’ll also add any updated thoughts, strategies, and illustrations/imagery to support our ideas. This way we have a piece of content that’s as in-depth as we can go. (Technical note: We’ll 301 redirect all previous article URLs to the one new guide, so we keep any existing SEO juice). There’s not a doubt in my mind that we’ll find some cringe-worthy articles (especially my much older articles). We probably won’t delete these articles, but if we have time, we’ll go in and update them or simply redirect the previous article URL to a more updated or relevant article). Deleting articles is a bad idea because they’ve most likely been indexed by Google and when the links look bad (someone gets a 404 error trying to view them), Google will penalize your entire site for that. WHERE DOES MADE VIBRANT FIT IN? Oh hello friends, Caroline behind the keyboard for this section (obviously I couldn’t let Jason talk about MV)! One sticking point for me when we talked about creating Wandering Aimfully was what to do with Made Vibrant, a brand I love and didn’t want to let go of. As much as I wanted it to stay as is, I knew that Wandering Aimfully was what I wanted for the future of our business. So I wondered if there was a way to still keep the essence of Made Vibrant alive. Through multiple conversations with Jason (and lots of solo contemplative podcast-walks), it became clear that Made Vibrant didn’t have to go away completely. Instead, it could live as an editorial arm of the blog with the purpose of exploring what it means to live, work, and create as our brightest, truest selves. What’s fun about coming to this decision, is that it also created a design challenge. The Made Vibrant posts should have their own unique look and feel so they’re visually recognizable to previous (or future) people who resonate strongly with the message of Made Vibrant BUT they also need to feel a part of and congruent with our Wandering Aimfully brand and website design. My design solution was to create a simple hand-painted border on the same article design, with an Made Vibrant delineation at the top of the article. We'll also have a Made Vibrant landing page where readers can explore just this kind of content—the soulful, emotional, heart-centered writing that I love so much but that might feel out of place next to a complete guide to SEO post. Having to let go of Made Vibrant seemed like a daunting decision to make. But reframing that decision as a small obstacle to overcome created a unique opportunity that inspired me. I’m excited that the Made Vibrant brand will continue to live on (both there and on my personal Instagram account) and that Jason and I both feel very comfortable about the visual separation of some of our content. A few years ago I stumbled into creating an extreeeeemely simple content calendar. It was a very basic Google Sheet that helped keep me accountable to my weekly writing and publishing schedule. One huge lesson I learned about consistent content creation is that it became much easier when I wasn’t trying to publish under tight deadlines. While I do love constraints and deadlines, for weekly blog content I needed to get ahead of my schedule. Using the simple spreadsheet above, I started to write down future blog topics and then started to get ahead. At one point I remember getting 8 weeks ahead of my publishing schedule! That was a fantastic place to be, because life can slap you in the face and derail your creative processes in an instant. For Wandering Aimfully, we’ve actually already been using a more in-depth version of my initial simple content calendar. 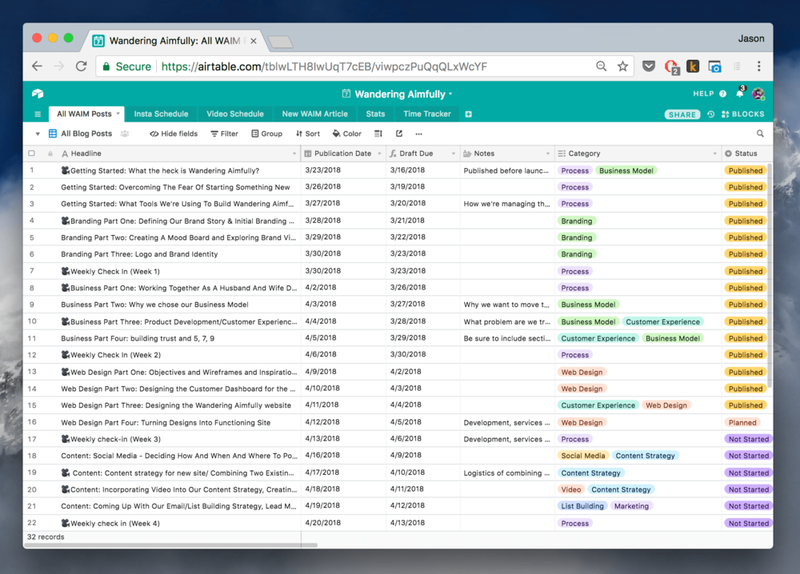 Caroline jumped in Airtable, our new favorite organizational tool, and went hard on setting up our content plan. Don't worry, we'll be writing an in-depth guide on this soon! Going back to that whole transparency thing I mentioned before, we aren’t forcing ourselves to get on a weekly publishing schedule of new content when Wandering Aimfully launches. We know that with the migration of all our existing content, we’ll have some newly optimized content that will be well worth sharing. Whether we’re creating new content or optimizing existing content, we will be laying out a date-based publishing schedule for our email list (something we’ll also talk more about later this week). First week of the month: An introduction to our history with money. How we had no system, no process, and how we accrued over $124,000 in debt. This week gives insight into our story and context. Second week of the month: The initial steps we took to getting out of debt (realizing it, admitting it, creating a plan to crush it). This week shares our mindset shift and intention setting. Third week of the month: How we manage our money after years of trial and error. We’ll share our Airtable sheet, our monthly budgets, the structure of our weekly budget meetings, and our overall plan of managing income and expenses. This week we get super tactical with all the how-to detail goodness! Last week of the month: We’ll host a live video Q&A about money! We’ll go over our processes and answer any questions people have about that topic. We might publish additional one-off articles throughout the month, but this lead-up would help get people excited about our in-depth guides and offer a publishing schedule where readers could digest the guide in sections. We feel like creating monthly themes also lets us go way in-depth on topics we have a lot of experience with. We don’t plan on having a theme every month of the year as that could get a bit overwhelming (but we haven’t started doing this yet, so you’ll have to find out along with us!). And one last thing about this idea, we see the live video Q&A as a fun way to open the doors to the limited amount of Wandering Aimfully memberships we want to sell monthly. Creating content with purpose also means being strategic about how it fits in to your overall business objectives! Hopefully you'll continue to follow along with us as we nail some things down and keep some things up in the air! That's what creating a flexible business that fits your ever-evolving values is all about! Now, if that post wasn't enough, hear us chat about how all our multiple content pieces fit together and complement one another in our unedited content meeting!